In 1921 the Beetle family of New Bedford, MA introduced the Beetle Cat boat as a means for children to learn how to sail safely while having fun. The Beetle Cat was the boat of choice since it was the only one design available in large quantities. Three to four kids in each boat getting the same instruction, sharing the same experience, building relationships and learning teamwork. Lessons learned that apply to all aspects of life. As time moved on, the sailing programs got away from the Beetle Cat in favor of fiberglass boats due to maintenance and storage cost. The “opti” was the boat of choice, small, light and cheap. Now we have one kid to a boat. Yes they learn to sail, but where are the relationships, the teamwork and the companionship of friends working together to a common goal while building memories for a lifetime? All that has been sacrificed for cost of the boat program. 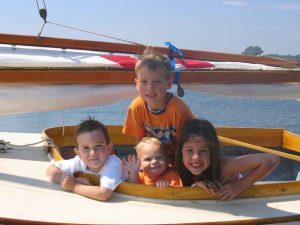 How many times have we seen kids sailing a Beetle Cat together, laughing, splashing water, and rousting each other while all the while sailing across the bay to some imaginary adventure. That opportunity has been lost when we put the kids in the “optis”. Let’s turn that around and provide our children and grandchildren the same opportunities we had to sail with our friends and build those long lasting memories with lessons learned along the way. Now is the time to get ready for the 2017 summer season. 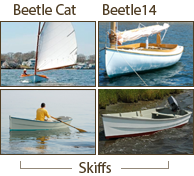 Contact the Beetle Boat Shop to discuss acquiring a Beetle Cat and get started on building your family sailing memories.